Myanmar Antique’s Chinese furniture are all dated to the 19th and early 20th Centuries and they are without exception crafted in elm. 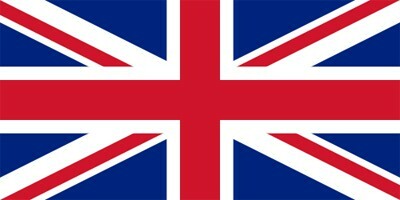 Elm is, apart from exceptional beautiful, also very durable and the added ‘’advantage’’ is that elm is relatively light. They are crafted on the basis of century old principles i.e. without nails, screws and glue, but with multiple layers of lacquer and wax. The vast majority of Chinese furniture has served functional needs whilst the timeless alter tables were used also to display owners treasured artifacts. 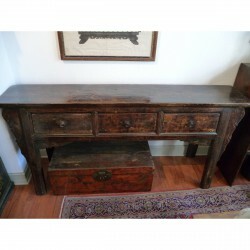 Without exception all antique furniture display signs of surface wear which fortunately have left a natural, but highly attractive smooth and subdued patina. Due to their fundamental simplicity and color mixture, Chinese furniture will blend in and add an extra dimension to the interior of any modern home. It is rare to find a piece of Chinese furniture with original locks and hinges and a close look will also reveal extensive restoration in form of newly applied lacquer and replacement of missing or damaged wood. Chinese furniture There are 24 products. 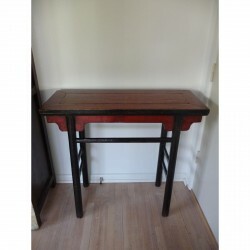 Nice, simple altertable from Qing Dynasty in red and black colors. Beautiful patina. Place of origin: China Material: Elm Height: 89 cm. Lenght/dept: 98/38 cm. Age: 19 cent. 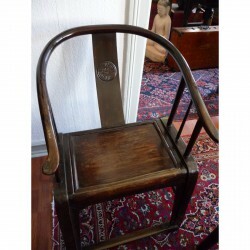 A nice baby highchair Place of origin: China Material: elm wood Height: 100 cm. Lenght/dept: 50/40 cm. Age: Last cent. 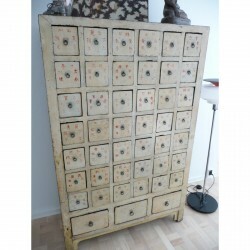 A unique medicincabinet in white colors. Intact and original. 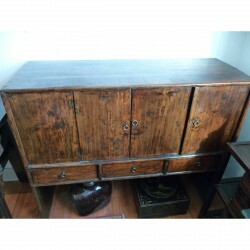 Place of origin: China Material: elm wood Height: 170 cm. Lenght/dept: 102 cm. Age: 18 th cent. 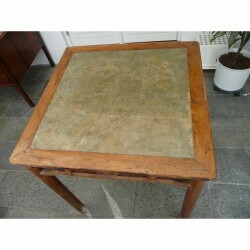 A small table with drawers in natural wooden color. Place of origin: China Material: elm wood Height: 77 cm. Lenght/dept: 92 cm. Age: 19 th cent. 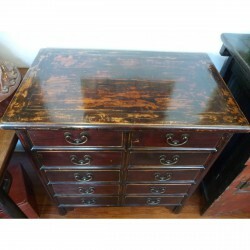 A very stylish cabinet, with lots of lacquer and a nice patina. Place of origin: China Material: elm wood Height: 88 cm. Lenght/dept: 84 cm. Age: 19 th cent. 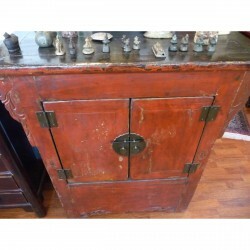 A very beautiful wedding cabinet in red colors, with lots of lacquer and a nice patina. 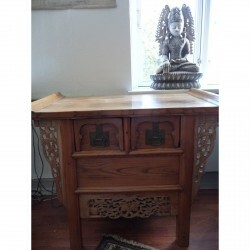 Place of origin: China Material: elm wood Height: 102 cm. Lenght/dept: 109 cm. Age: 19 th cent. 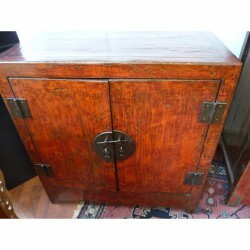 A solid cabinet in wooden colors with metalfittings. Place of origin: China Material: elm wood Height: 86 cm. Lenght/dept: 109 cm. Age: 19 th cent. 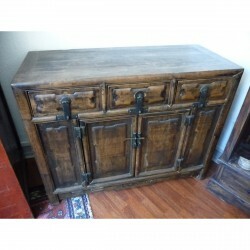 A beautiful cabinet with drawers. Place of origin: China Material: elm wood Height: 95 cm. Lenght/dept: 90 cm. Age: 19 th cent. 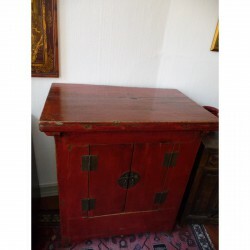 A beautiful red cabinet with lots of space inside. Place of origin: China Material: elm wood Height: 106 cm. 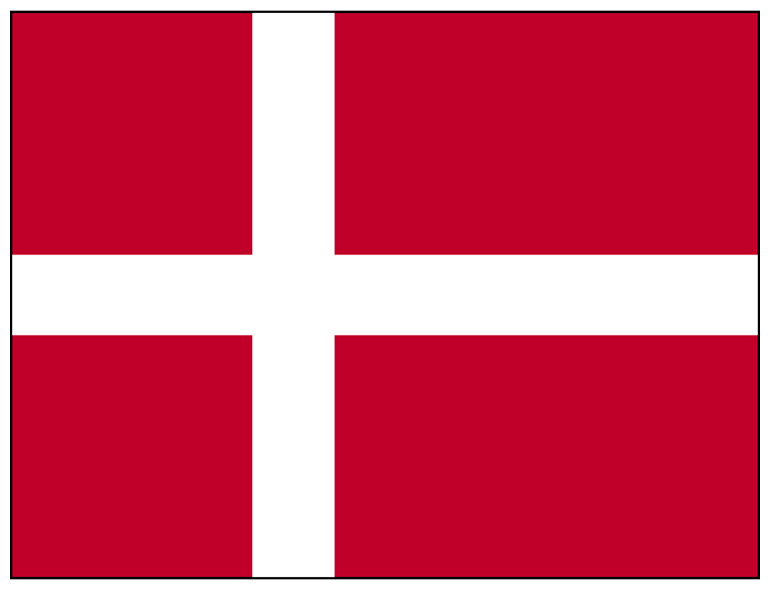 Lenght/dept: 94 cm. Age: 19 th cent. A simple cabinet with drawings and doors. Place of origin: China Material: elm wood Height: 105 cm. Lenght/dept: 125 cm. Age: 19 th cent.